A New York man accused of killing a UPS driver in a parking lot said in court Monday afternoon that not only did he believe he shot and killed Donald Trump, but that no evidence could be presented to him to suggest otherwise. Barkley said during his arraignment and attempt to plead guilty, “I shot and killed Donald Trump purposely, intentionally and very proudly.” Barkley, who is being represented by attorney James Baker, attempted to plead guilty to the charges against him. Before being sworn in for the guilty plea, he declined to further consider a not guilty plea by reason of mental disease or defect. I have a bad feeling this will provide a large opening for gun control based on mental illness, but what a loon! 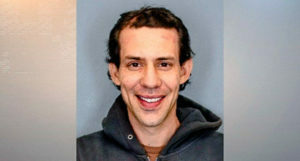 Justin Barkley, a 38-year-old Ithaca man, is charged with second-degree murder for the shooting death of William Schumacher in a Wal-Mart parking lot Dec. 8. But during Barkley’s arraignment hearing Monday, during which he attempted to enter a guilty plea, Barkley says the person he killed was Trump, not Schumacher. The judge refused Barkley’s guilty plea and ordered him to undergo a psychiatric evaluation to determine whether he is fit to stand trial. If he does stand trial and is convicted, he faces 25 years to life in prison.